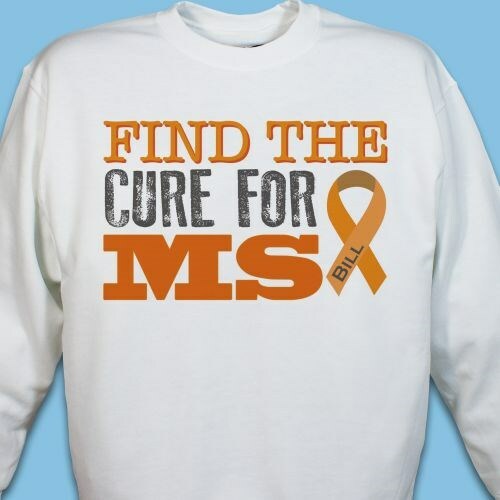 Inspire others to help you Find a Cure for MS whenever you wear this MS Awareness Sweatshirt! Whether you rock it at your next fundraising event or around town, your message will be loud and clear when you wear one of our multiple sclerosis shirts. This MS Awareness design is printed on our 50/50 cotton/poly, machine washable sweatshirt, available in youth sizes XS-L & adult sizes S-3XL. Free personalization of any name is included. Additional Info If you buy one of our Find the Cure MS Sweatshirts, a portion of your purchase will go to the organization of your choice. Shop our other MS Awareness Gifts and select a MS Organization for your donation! You can give back and look great at your next event.